The Milwaukee County Housing Division’s Homeless Outreach Team, led by Eric Collins-Dyke, are using the FoneTrac safety app to help them stay safe. This pilot program was created to support them on the streets while exploring how its features can support their business model in other ways. Milwaukee County’s team was selected for this pilot because of their innovative approach and proven success as they work to eliminate chronic homelessness. Their outreach workers are on their streets both by day and by night. FoneTrac’s panic alert feature helps keep them safe wherever they find themselves working. Built to get help rolling at the touch of a button, FoneTrac lets the outreach team focus on their clients instead of worrying about risk. FoneTrac’s check-in feature offers an additional benefit to the team. Their check-in records, accessible through FoneTrac’s dashboard, provide their administrator with visual records of locations where they made their stops. These records offer support for wide scale outreach efforts such as Point in Time, as well as simple, paperless tracking of client contact locations. 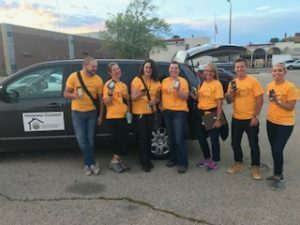 The Point in Time Count, held twice a year in certain regions, sends outreach workers and teams of volunteers out at night to conduct surveys and count how many homeless people they find. Milwaukee County’s outreach team participated in this July’s Point in Time Count with FoneTrac as one of its partners. Tim Bradley of IMG GlobalSecur trained administrators on FoneTrac setup and use, helping them build and add profiles for their Point in Time teams. Faith Kohler supported the team as they created a process for check-ins and panic alerts. On July 25,2018 at 7 p.m. the team was ready to roll! With one FoneTrac user assigned to each vehicle and a defined process for check-ins, the outreach team conducted their nighttime Point in Time count with an additional layer of security (and a valuable business tool) in their hands. As these dedicated people offered comfort, humanity and housing to members of their communities living outdoors, FoneTrac gave them peace of mind, created by security experts who truly understand personal safety!